There’s a legend in Australia of a shadowy creature called the bunyip which lurks at watering holes, swamps: places which are just a little removed from everyday life. It’s described as having dark smooth fur, tusks or large prominent teeth, a dog-like face and is pretty big; big enough to drag you to an early and watery grave. Now, you’ll be glad to know we aren’t writing of a newly discovered bunyip. This is the story of the beautiful, enormous beast Diprotodon optatum, which some believe was the basis for the legend of the dangerous swampy fiend! 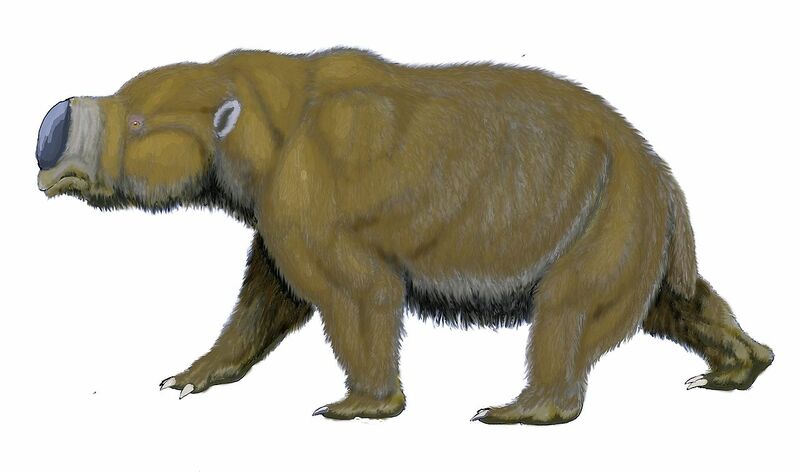 Today’s wombats and koalas are distant relatives, but Diprotodon optatum did its own unique jolie laide version of cute and cuddly on a massive scale. There were several species of Diprotodon, but this was the largest. Roughly the size of a smallish modern hippo or rhino, this giant had sturdy legs ending in hairy little turned-in toes, very similar to wombat’s feet. As with all other marsupials, they carried their young in a pouch. The prominent front teeth gave this beast its Latin name; Diprotodon translates as Two First (or prominent) Teeth. The esteemed Victorian academic Thomas Henry Huxley examined the first bone assemblages containing Diprotodon remains, and his stringent analysis of jaws and molars provided some understanding of the animals’ diet. The structure of the mouth and teeth allowed this animal to tear into tough woody plants as much as succulent leaves and fruits. The overall appearance resembles a very large hamster, weighing around 2700kg. The first Diprotodon optatum fossils were found in New South Wales, in the early 19th century. Subsequent finds were so well preserved, many naturalists thought they were the remains of an undiscovered extant species. Many remains were around lakes and marshlands, presumably where the giant met its fate searching for water during droughts – maybe this was what sparked the myth of the bunyip and the association of Diprotodon with it. Environmental change and Diprotodon’s fate are inextricably linked; the original climate of Pleistocene central eastern Australia facilitated luscious dense rainforests, vegetation-rich wetlands and some open savannah grassland further inland: this was the period when Diprotodon evolved around 1.6 million years ago. With so much delicious vegetation to graze on, these big marsupials were more than happy; these were creatures requiring somewhere between 100 to 150kg of herbs, grasses and fruits per day. Trace fossils, those rare and underappreciated marks left by once living animals and trapped in the rocks for millennia, provide a glimpse into lives long gone. At Lake Callabonna, South Eastern Australia, there is an ancient trackway; a trackway made by many Diprotodon optatum. The muddy deposits of the lake preserved the tracks made by these giant marsupials, with indentations of the paws as they made their way across the mud. The trackway shows us that this group was moving in a herd. But it also tells of another tale. A tale of drought and death. In the Late Pleistocene, the climate started changing in eastern and southern Australia. The predictable and regular monsoons weakened and became erratic, resulting in reduced precipitation. Vegetation changed and many megafauna perished in their quest for water. At Callabonna there are the remains of many large and awkward creatures which became trapped in the soft, sticky lake mud and died. Towards the Late Pleistocene, all Australian fauna had an added and lethal peril – humans. Diprotodon became extinct about 40,000 years ago, and it is certain the last of the line would have encountered humans who had crossed shallow seas and temporary land-bridges to reach Australia by around 50,000 years ago. Mysteriously, there is uncertain evidence for butchery of any Diprotodon optatum bones found to date; these lumbering herbivores surely would have made easy targets for hunters. Cuddie Springs in south-eastern Australia is one of the few sites that display evidence that extinct megafauna and humans were around at the same time, at the same place. Part of the bone assemblage found there comprised of a Diprotodon mandible and a tarsometatarsus from the large flightless bird, Genyornis newtoni, with a stone flake tool wedged between them. The surface analysis of the bones has so far proved inconclusive with regards to butchery, and there are also chronological and stratigraphical issues with the finds, so the jury is still out with regards to human hunting activity being a major causal factor of Diprotodon’s extinction. Other finds on Liverpool Plains, within the same area of Australia have come with claims of very late extinction dates of between 20,000 years and 6,000 years BP, although there is no revised or up-to-date substantiation of these claims. The ‘engraved’ Diprotodon tooth found at Spring Creek is equally controversial, with some considering it to be an indicator of human artistic agency, while others have suggested the grooves on it are gnaw marks from scavengers. The really interesting aspect of this find is the radiocarbon date – 19,800 ±390 years which may make the Liverpool Plains hypothesis not quite as unfeasible as it first appears. It would appear, though, that most agree that populations of the mega-cuddly critter were already critically declining by the time humans arrived in Australia. It seems likely that a cluster of factors, ranging from fire-clearance of land by humans, to climate change all conspired against this unique animal in the late Pleistocene. While it was considered briefly that some petroglyphs in south-eastern Australia may have represented the hairy little pads of Diprotodon feet, it’s mostly – and disappointingly – acknowledged the rock art is much too recent to show any detail of the creatures. If the descendants of ancient peoples of Australia found bones of huge creatures by inland lakes, they could very well have wondered what kind of monstrous animal these were, and linked them to the folk memory of herds of gently ambling Diprotodon, wandering the savannah and scrublands of Australia’s southern expanses. It could be easy to associate fireside scary stories with the gigantic bones, and give rise to the legend of the bunyip (I seem to remember much worse things being fabricated at Girl Guide field-trips!). We may never know, but we can look at the remains of Diprotodon optatum, and marvel at the biggest and perhaps cuddliest representative of Australian Pleistocene megafauna. 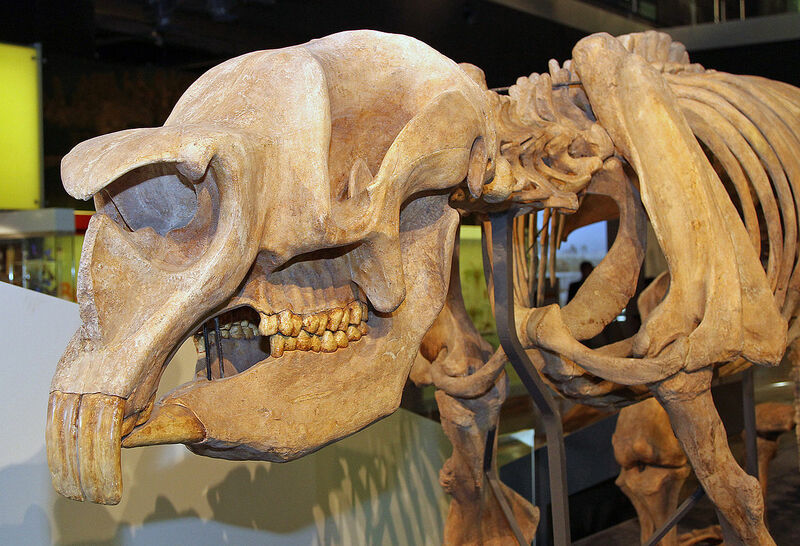 Nice webpage with detail of Diprotodon from Melbourne Museum: click here. Dodson, J; Fullagar, R; Furby, J; Jones, R and Prosser,I. (1993), ‘Humans and megafauna in a late Pleistocene environment from Cuddie Springs, north western New South Wales.’ Archaeology in Oceania. 94-99. Gorecki, P. P.; Horton, D; Stern, D and Wright, R. (1984), ‘Coexistence of humans and megafauna in Australia: improved stratified evidence.”Archaeology in Oceania. 117-119. Huxley, T, H. (1862), ‘On the premolar teeth of Diprotodon, and on a new species of that genus.’ Quarterly Journal of the Geological Society 18. 1-2. 422-427. Price, G. (2012), ‘Plio-Pleistocene climate and faunal change in central eastern Australia.’ Episodes-Newsmagazine of the InternationalUnion of Geological Sciences 35. 1 160. This entry was posted in Diprotodon and tagged Australia, bunyip, Diprotodon optatum, Genyornis newtoni, Koala, Lake Callabonna, Marsupial, New South Wales, Pleistocene, Pliocene, Spring Creek, Thomas Henry Huxley, Wombat. Bookmark the permalink.